New 3-D 'Journey' Sparks A Trip Back To The '50s There's a new Hollywood take on Jules Verne's 1863 novel; seeing it sent Bob Mondello back into the nearer past — to the wide-screen version of the tale he saw when he was a kid. Turns out it's still kinda fun. 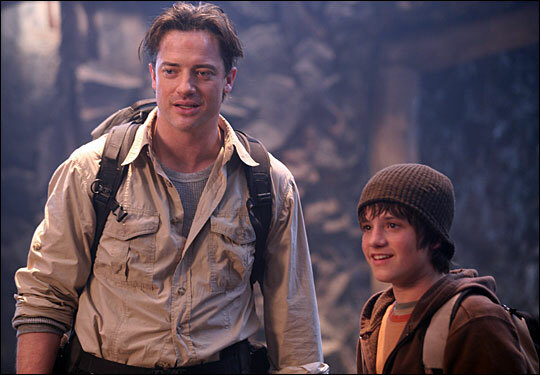 Hollywood's latest Journey centers on a geologist (Brendan Fraser, left) and his nephew (Josh Hutcherson). 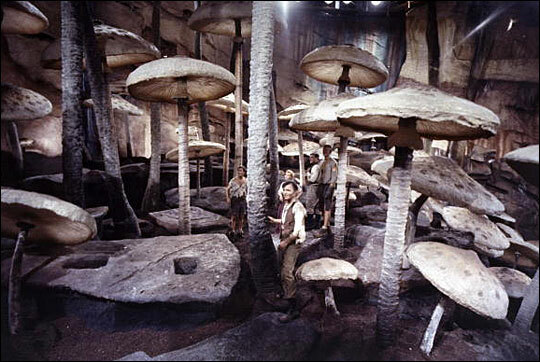 Below: The 1959 spectacular Bob Mondello remembers so fondly starred James Mason and a forest of giant mushrooms — not to mention a sweaty, shirtless Pat Boone. 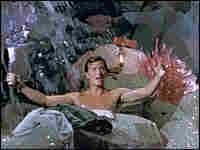 Pat Boone — he was 25 then, and not shy about showering in a crystal cave — provided the teen-scream factor for '50s audiences. The 3-D effect in the latest version of Journey to the Center of the Earth? It proves every bit as cool as you think it'll be. When the explorers reached Jules Verne's unlikely underground sea and a football-sized fish flew right at my head, I almost broke the arm of the kid in the next seat trying to get out of the way. Seriously cool effect. And there are lots of others, because the filmmakers want this to be a movie you'll want to see in theaters, not on video six months from now. But with all due respect to director Eric Brevig and his army of special-effects digitizers, this new Journey couldn't replace the one that's been playing in my head since I was a little kid. That one I watched on the widest screen I had ever seen — because 1959 was also a time when Hollywood wanted to draw people away from their TV sets. Back then, the TVs were tiny, not to mention black-and-white, so movies got big and colorful. Scored by Bernard Herrmann, Journey to the Center of the Earth played on a screen as wide as Ben-Hur did. It was huuuuge. 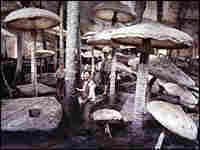 And to the delight of not just me but all my schoolmates, the actors were dwarfed by mushrooms the size of trees, by giant lizards that glowed red when you stepped on them, by lava that looked a lot like beef chili, and earthquakes and — 20 years before Raiders of the Lost Ark — a huge boulder that came rolling at our intrepid explorers as they navigated a narrow passageway with no way out. Miraculously, of course, they escaped, and professor Lindenbrock landed face-down right on top of what he needed to see: three notches left by another explorer, who'd gone to the center of the Earth centuries before them — and whose skeleton would point the way when they most needed it. This movie seemed so cool to me as a kid that I was actually sort of afraid to rent it now and risk finding that my memory had inflated it. A little Web research was not reassuring; Henry Levin's other film that year was Where the Boys Are. And who got top billing? Not James Mason, who played the professor, but singer Pat Boone, doing a Scots accent when he remembered to — and, once the trail leads to hot lava, parading shirtless, in skimpy shorts. Back then, that was pretty racy stuff for the teenage girls in the audience. And of course you couldn't put a singing heartthrob in a movie without having him sing a love song, even if you had to shoehorn it into the plot, in this case by providing the professor with a pretty daughter — and a piano in the parlor. 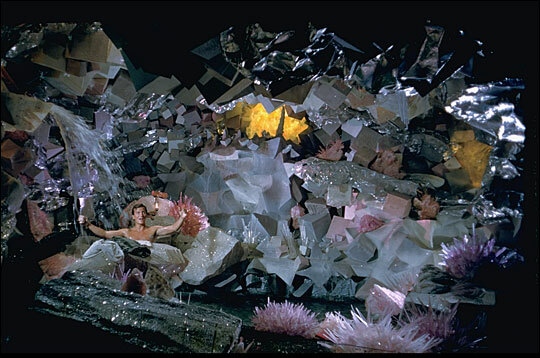 The wide-screen stuff still looks pretty amazing — fake but amazing — filmed in Carlsbad Caverns and on soundstages where in those pre-digital days they actually had to build mushrooms the size of trees. And I'd totally forgotten the duck — Gertrude was her name — who led them into tunnels they hadn't noticed. Oh, it was great fun. Still is, even on video. So OK, enough of memory lane. 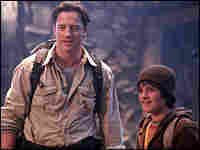 You want to know about the new Journey to the Center of the Earth, the one in 3-D or REAL-D or whatever they're calling it. It's considerably more "real"-looking — in a differently fakey way. And it's fun, too: postmodern and jokey, not old-fashioned and hokey. But definitely fun. Brendan Fraser has bigger muscles than Pat Boone did, and the lizards look like T. rexes now rather than salamanders, and there's an underground roller coaster that's gonna make a great theme park ride if the movie's a hit. And then, after you've seen what special-effects folks can do today — which is spectacular — think about renting the old one to see what they did a half-century ago, which was spectacular. The characters, the effects, the situations — all different, so it won't feel like a re-run. It'll just show you what Hollywood used to do, and do well, done well.